In its fourth year, Illumination at The Morton Arboretum in Lisle, IL once again melds the magic of the holiday season adeptly with nature. 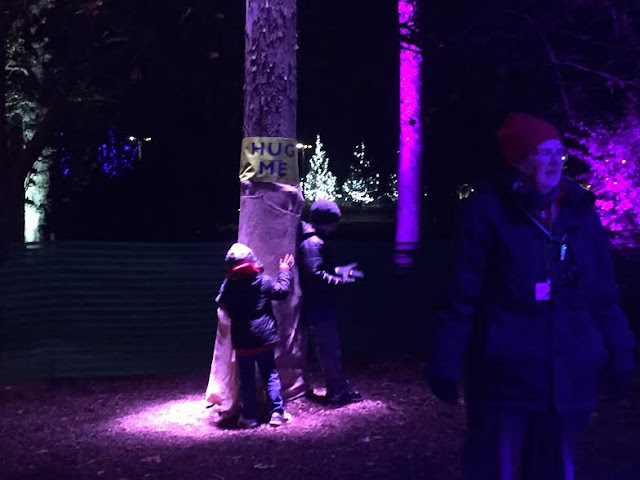 The Morton Arboretum has truly innovated the concept of the holiday light show into a dazzling outdoor adventure that delights and engages families in hands-on activities. Even though our visit this weekend was our fourth visit over the years, my daughter was still engaged in experiencing each hands-on element. They have now become beloved old favorites! 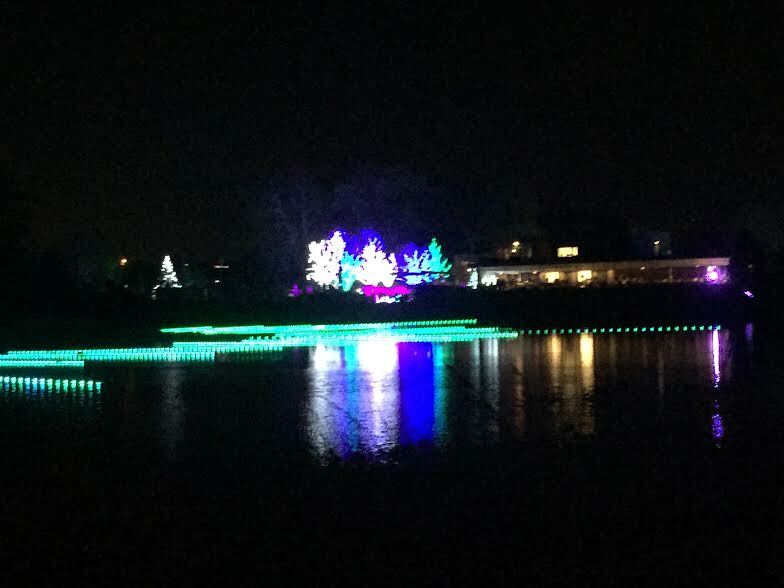 Lights "flow" across the water. 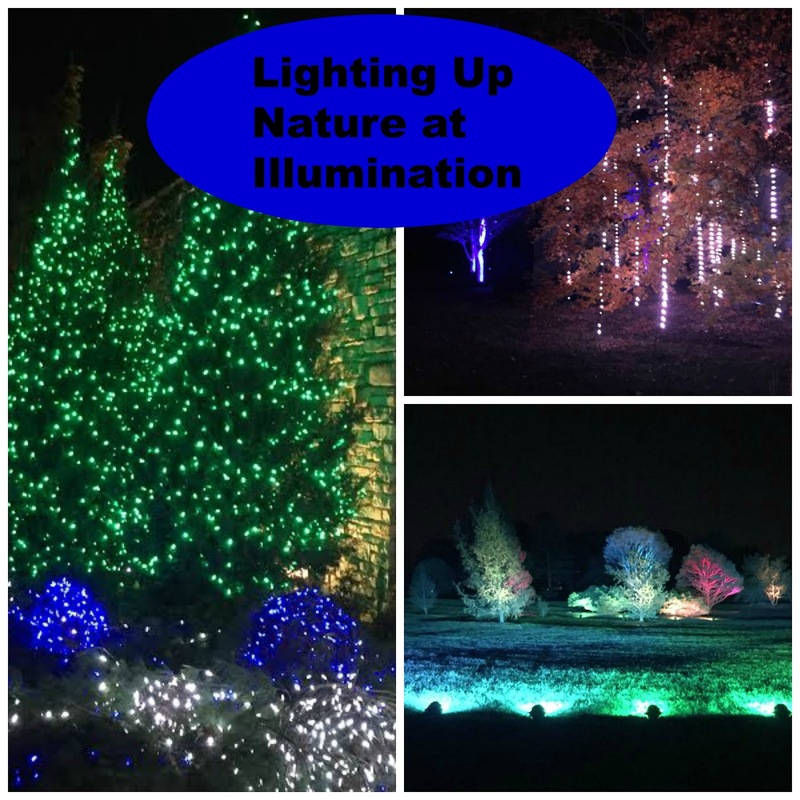 A gentle walking path leads visitors through displays blending lights of different colors and using effects to highlight nature at night. 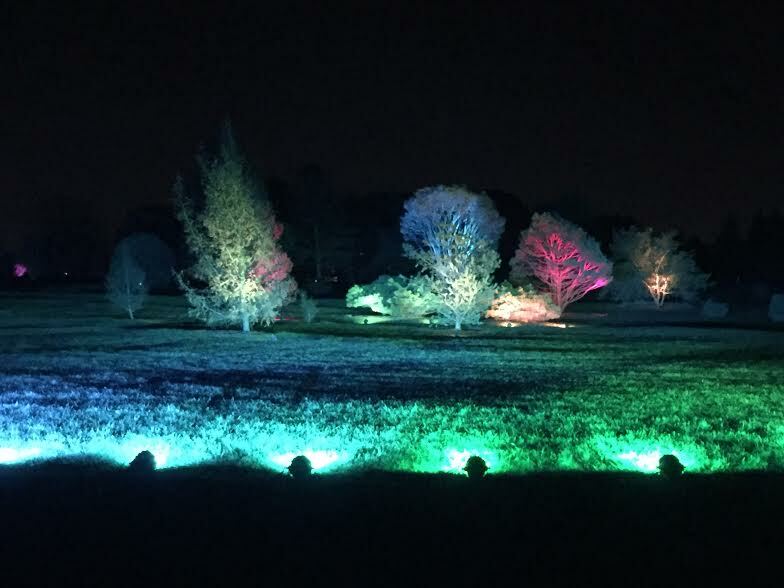 The first vantage point allows you to admire lights that stream over the pond. Beautiful and serene in a whole new light! Hugging a tree causes the tree to turn different colors. We wound around the lake admiring the flow of lights from different spots. As we made our way through, we came to a spot where we could hug a tree. Who can resist hugging a tree? As you hug, the colors of the tree changes. Around the bend from Hug a Tree is the Tinsel Forest where you can sing to the trees and you will be rewarded with a sparkly display. The Tinsel Forest uses lights to capture the idea of tinsel in the trees. Another favorite is ornament hill. I love the different shapes of lights. The delicate white lights give the appearance of a snow dusting. Beautiful! Ornament Hill captures the look of a carpet of snow with lights. 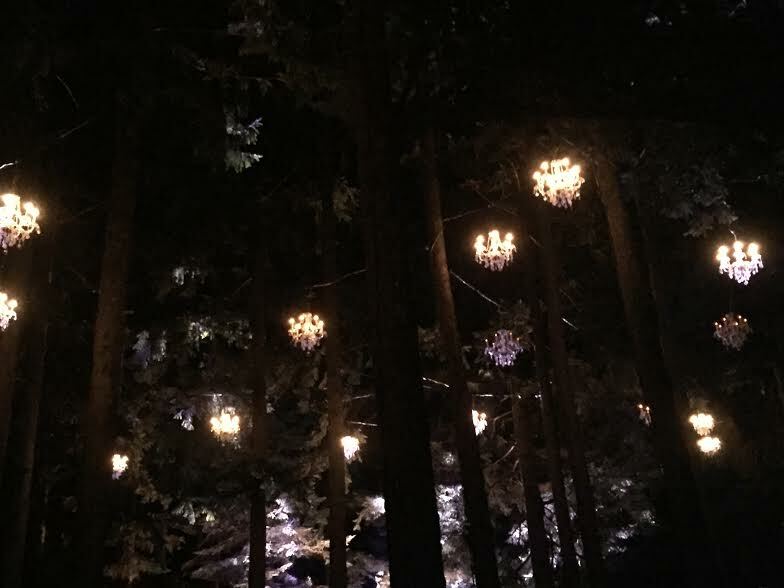 Crystal Promenade brings chandeliers to the trees. Reminiscent of Phantom of the Opera! Chandeliers swinging in the trees. Artistrees allows kids to "airbrush" the trees with their hands! Children airbrush trees with light. 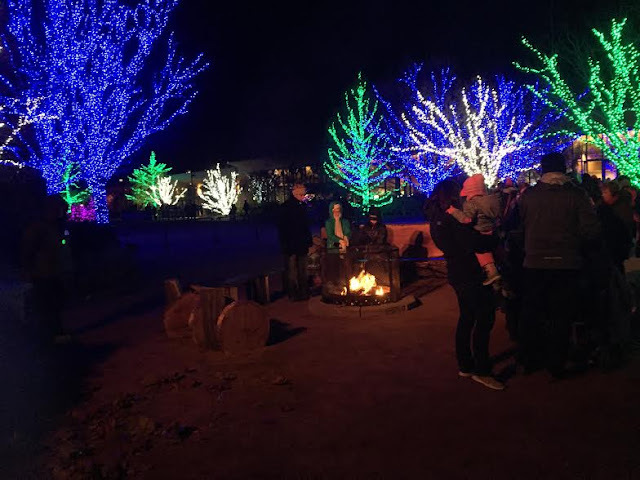 20 miles of cable, 25 designers, technicians and crew and 50 acres help put together this sparkling winter wonderland. 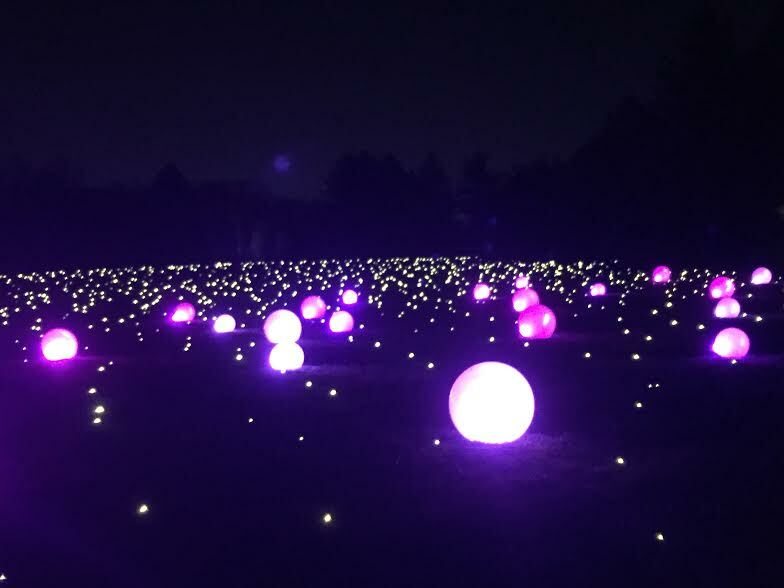 Seeing The Morton Arboretum in a new light is an enchanting way to spend an evening. 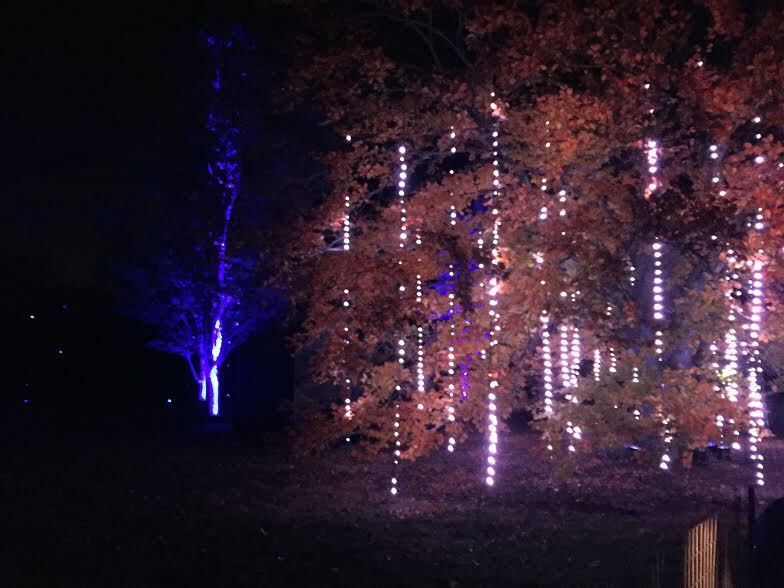 Playing with light effects is a unique experience for children and really adds to the magic of the season! A fun adventure that we are so lucky to have in the Chicago area! Campfire warms up the night! There are two warming stations where you can duck in and warm up. Inside, you will also find warm beverages, light snacks and even glow items for sale. There also are three fire pits. S'mores kits are available for purchase. Bring a warm beverage in a thermos. You will be able to get something when inside. However, you may have to walk from the overflow parking and wait a bit in line. So, a warm up will be nice! We have purchased hot chocolate at Illumination before. It is HOT -- so it may take a bit to cool off before you can drink it. The second warming station is usually less congested than the first. Tickets DO sell out, so purchase ahead of time online. Some nights have musical acts, so check the schedule. **Disclosure: We did receive complimentary tickets in order to facilitate this review. No other compensation was received. All opinions are 100% my own. It is! A magical and unique event! Very cool! I was at the Morton Arboretum either last summer or the summer before with one of my best friends who lives up your way. We loved the butterfly house, looks like I should come back in winter time! #Travelingadventuresofafarmgirl. There are definitely things to do there in the winter. They have their train show in January and huskies visit at the end of the month. They also have snowshoeing and cross country skiing. Great place to get outside all year round! Pinned this! Hoping I can visit soon! This is so cool! I find coloured lights so relaxing! There's something similar in Dubuque, IA which I can't wait to visit, they has a drive through section too!